Low-profile high bays feature sturdy aluminum construction, high light output, microwave occupancy sensing, 0-10V dimming control, low 7% minimum standby dimming level, and IP65 incursion protection. Operate on all voltages between 120-277VAC. High efficacy and long life (50,000 hour). High shock & vibration resistance; 50%+ savings in energy consumption; no mercury, no noise, no flickering, and no UV. Ideal for low- and high-ceiling lighting applications in warehouses, manufacturing facilities, big-box retail stores, gymnasiums, cold storage, convention centers, or sporting arenas. ETL, IP65, and RoHS-complaint. 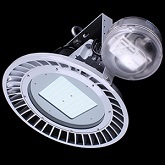 Click the button below to add the 150 WATT LOW PROFILE DIMMABLE LED HIGH BAY WITH OCCUPANCY SENSOR to your wish list.